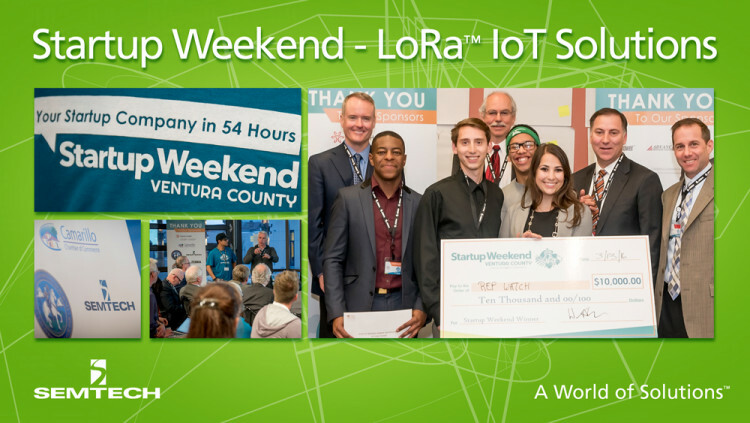 Semtech Corporation (Nasdaq: SMTC), a leading supplier of analog and mixed-signal semiconductors, is pleased to announce the integration of its LoRa™ wireless RF technology in many of the projects created during Startup Weekend Ventura County on March 11-13 at Rancho Campana High School in Camarillo, Calif. Qualified teams were picked out of dozens of applicants to participate in the hackathon-style event organized by Dignity Health’s St. John’s Hospital and Camarillo Chamber of Commerce and were given 54 hours to come up with their best solutions to address the needs of agricultural and medical challenges in the Ventura County area. Winning projects were chosen for three different categories: Healthcare, Agriculture and People’s Choice. The overall winning startup was awarded $10,000 of seed funding. The top IoT healthcare award winner went to RepWatch, a product designed to monitor patients’ workout routines to make it easier for physical therapists to make adjustments. This injury prevention tool would potentially reduce a patient’s recovery time and the cost of therapy. RepWatch was also the overall winner of the $10,000 award. The other award winners were Bye Bye Birdie, which won best IoT Agriculture solution for its ingenious use of sensor technology and robotic vehicles to deter birds from tampering with crops, and Veggie Bot, which won the People’s Choice award for a sensor-enabled robot that could be packaged with every shipment of fresh produce to monitor its condition. Semtech’s Senior Vice President and Chief Marketing Officer Alberto Guerra was one of the competition judges who reviewed the startups’ models presented to the public on Sunday evening. Semtech was the official technology sponsor of the weekend and provided a full-day training on a working LoRa-based starter kit for all interested participants on March 5. Attendees were given access to a local low power wide area network deployed by Senet using LoRa-enabled starter kits. Semtech’s LoRa team has participated in several other IoT workshops and hackathons worldwide to introduce and disseminate its LoRaWAN™ solution. Beyond healthcare and agriculture, LoRa technology is being used worldwide in key applications such as detecting gas leaks in Korea, monitoring volcano and earthquakes in Japan, and a variety of Smart city applications that help cities control street lights, traffic signals, and natural resources such as water, gas and electricity. For more information about LoRa wireless RF technology and the LoRaWAN protocol, visit www.semtech.com/wireless-rf/lora. All statements contained herein that are not statements of historical fact, including statements that use the words “would,” “could” or other similar words or expressions, that describe Semtech Corporation’s or its management’s future plans, objectives or goals are “forward-looking statements” and are made pursuant to the Safe-Harbor provisions of the Private Securities Litigation Reform Act of 1995, as amended. Such forward-looking statements involve known and unknown risks, uncertainties and other factors that could cause the actual results of Semtech Corporation to be materially different from the historical results and/or from any future results or outcomes expressed or implied by such forward-looking statements. Such factors are further addressed in Semtech Corporation’s annual and quarterly reports, and in other documents or reports, filed with the Securities and Exchange Commission (www.sec.gov) including, without limitation, information under the captions “Management's Discussion and Analysis of Financial Condition and Results of Operations” and “Risk Factors”. Semtech Corporation assumes no obligation to update any forward-looking statements in order to reflect events or circumstances that may arise after the date of this release, except as required by law.